What began with meditations on the value of compassion in our daily lives concluded with a practical discussion of how Buddhism can help make better lawand better lawyers. A rose mandala created by artist Chrysanne Stathacos was at the center of the ring of scholars who conversed with the Dalai Lama. The landmark, three-day visit to UB by His Holiness the 14th Dalai Lama ended on Sept. 20 with his participation in the conference "Law, Buddhism and Social Change," held in an intimate setting within the UB Law School library. It was the Dalai Lama's first visit to a U.S. law school conference and one of the few times he's been asked publicly about legal matters. Seated among a circle of 15 international scholars, legal practitioners and UB professors, the Dalai Lama for more than an hour answered questions on topics ranging from the political role of monks to the function of law in a capitalistic society. But it was his brief responses to questions about ethical dilemmas confronting lawyers that aroused the most interest from some participants, and provided the framework for future discussion within the UB Law School. "If some person commits a crime but tries to prove that he is innocent, that is 'dirty law,'" said the Dalai Lama. "And religion also...if you use religion the wrong way, then religion becomes dirty religion. Every human activity, whether it becomes constructive or not, depends on the motivation." The guiding motivation for practicing law, the Dalai Lama said, should come from "the basic human quality which we learn from birth: affection, and from that the value of human compassion." In another exchange, conference participant James Magavern further explored the issue of legal ethics, asking the Dalai Lama whether "we are dirty lawyers" when protecting the confidentiality of a client who has confessed a prior crime. The Dalai Lama stressed that each case and each person should be viewed individually. "Sometimes you have a context where the benefits of the individual have to be weighed against wider implications to society," he said. "Or, in some cases, the benefits to the community have to be weighed against the damage it's going to do to the individual. The main point is not to confine your evaluation purely to a single situation, but rather look into its broader implications." More than 140 people, including several members of the New York State Bar, listened to the discussion in the law library, while another 350 people watched a live broadcast of the conference in two law school classrooms. Rebecca French, UB professor of law, conference organizer and an authority on Tibetan law, initiated the morning conversation with the Dalai Lama by asking about the political role of Buddhist monks, to which the Dalai Lama responded: "As far as party politics is concerned...I will never touch party politics. "Another kind of politics relates to the national struggle in the case of Tibet," he added. "National freedom is very much related to the teachings of Buddhism. Therefore, I consider my service in the Tibetan national freedom struggle part of my practice of Buddhism, (which involves) serving others, helping others and also the practice of, or implementation of, compassion." The Dalai Lama's commentary on philosophical topics like the role of religion in a democratic society was interspersed with examples of his trademark wit and humor, which drew big laughs from an attentive audience. When asked about the best way for professors to teach law, for example, he replied: "Oh, I don't know. In order to give you some kind of advice, I should study law and practice law...and make more money." Law School Dean Nils Olsen said the Dalai Lama's talk was a momentous event in the law school's history and was symbolic of the school's longstanding focus on the interdisciplinary study of law. "We're very concerned with the social and historical context in which law is made and practiced," Olsen noted. "To have the opportunity to have that kind of intimate discussion with a person of the Dalai Lama's stature is so rare, and really demonstrates his commitment to education." 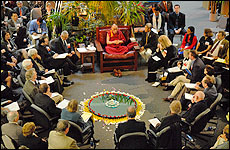 After the Dalai Lama's departure, participants continued the two-day conference by discussing and debating the meaning of the Dalai Lama's statements. "I think we should do a complete rethinking of the way we go about teaching law students entirely," said French. "The Dalai Lama wants heart, he wants compassion and he wants selflessness in attorneys. Our law school can start by taking this to heart. As a group, our law faculty can start thinking about how you go about instilling those ideas in students." "How you distill a set of rules from those two things is another issue, but if you begin there and you infuse the rules with these two qualities, the hope is you'll end up with a better practice of law." According to French, the UB Law School, through its Law and Buddhism Project, already has begun to incorporate Buddhist principles of compassion into legal study and practice. Laura Mangan, associate director of UB's Baldy Center for Law and Social Policy, headed with French the conference's planning committee, which produced a commemorative poster of the event. A rose mandala created by artist Chrysanne Stathacos was at the center of the ring of scholars who conversed with the Dalai Lama. A display of Tibetan legal manuscripts, donated by French and on exhibit in the law library, drew the interest of the Dalai Lama prior to the conference's start and complemented the occasion.